Casting Homeowners for a Design Show! 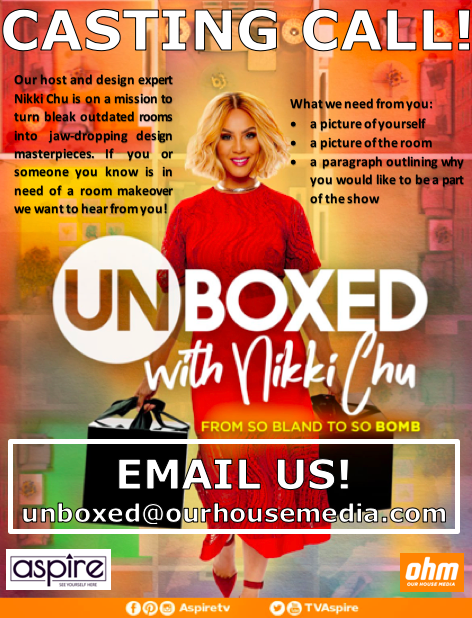 Our House Media is casting homeowners for a design show called Unboxed with Nikki Chu Season 2. The show airs on Aspire Network, the only television network that celebrates, shares and reflects black culture + urban lifestyle. 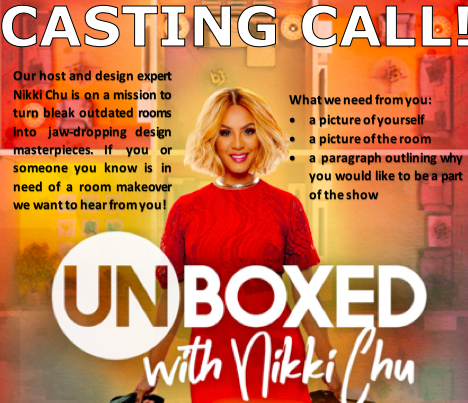 We’re looking for dynamic and fun people with big personalities in the LA area who would like a room makeover! If you haven’t seen the series on air, please check out the network’s website: aspire.tv. The premise of the show is Nikki, our host and designer, surprises homeowners with a room makeover. The catch, she presents two mystery boxes, each box containing design elements that represent two different designs. Participants can only choose one box, and leave the rest of the decisions to Nikki and her team. While participants leave their house, Nikki and her team of experts complete the transformation in 2 days, just in time for the big reveal. We ask that one of the people appearing on camera lives in the house full-time, their partner can also live in the home or be a friend, family member or coworker! Please note, we do not do kitchen or bathroom designs since this is a 2 day makeover. Also, there are no costs to you, the homeowner, we just ask that you make yourselves available for 2 film days and that you arrange for somewhere to stay for a couple of nights while the work is being done. We will be filming in April.